It’s nighttime. 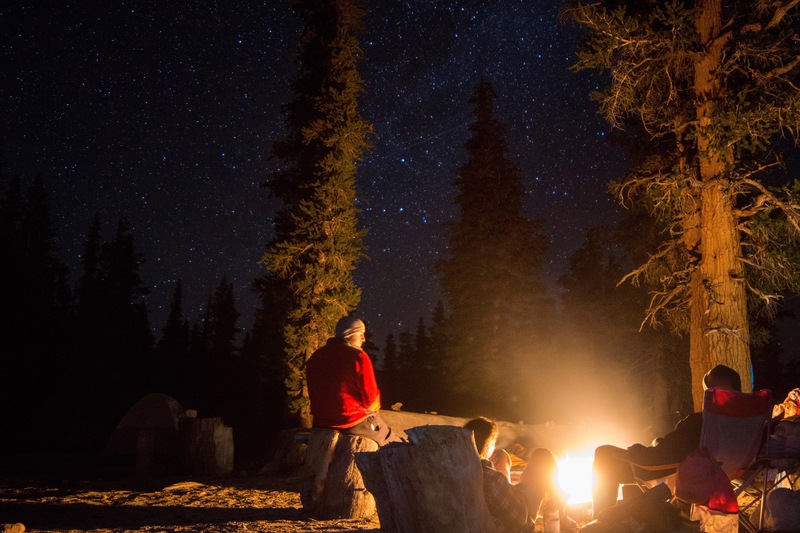 Under a star-speckled sky, you listen to chirping crickets and the hiss of logs on the fire. You take off your boots, exhausted. In the distance, a wolf howls. Your stomach churns. The wind shifts, and smoke from the fire sears your eyes. But that’s not why you’re tearing up. You realize that you are hungry. Your fellow campers are hungry. And it’s your turn to cook tonight. All talk has ceased. Your friends, illuminated by the red glow of firelight, watch you expectantly, clutching their sporks. With trepidation, you pull the ingredients from your bag. But what will you make? 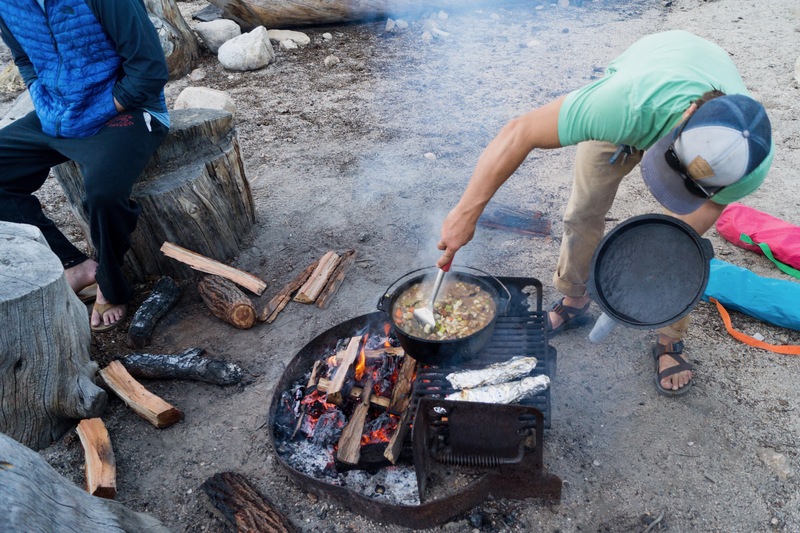 Cooking and camping can be a daunting combination. You’re often stuck with relatively few ingredients, not to mention you lack the usual kitchen conveniences (e.g. having any utensil you could possibly need, being able to see the pan, etc.). However, there is hope. Here are a few simple and fun camping recipes I’ve compiled from either personal success or friends’ recommendations. Feel free to substitute, remove items, or adjust serving size to personalize each meal to your own taste. I first had this on a weekend camping trip with friends from my college Outdoors Club. We’d hiked seventeen miles that day and were in need of a heavy meal. This recipe was the perfect solution. Instructions: This is best if cooked in a hot fire, but it can also be done on the stovetop. Chop the veggies, pour in the spices and sauce, and throw it into the dutch oven (pot with lid/cover). Place the dutch oven over a hot fire for about an hour, stirring occasionally. If you have the time, I highly recommend grabbing a box of cornbread mix, too. 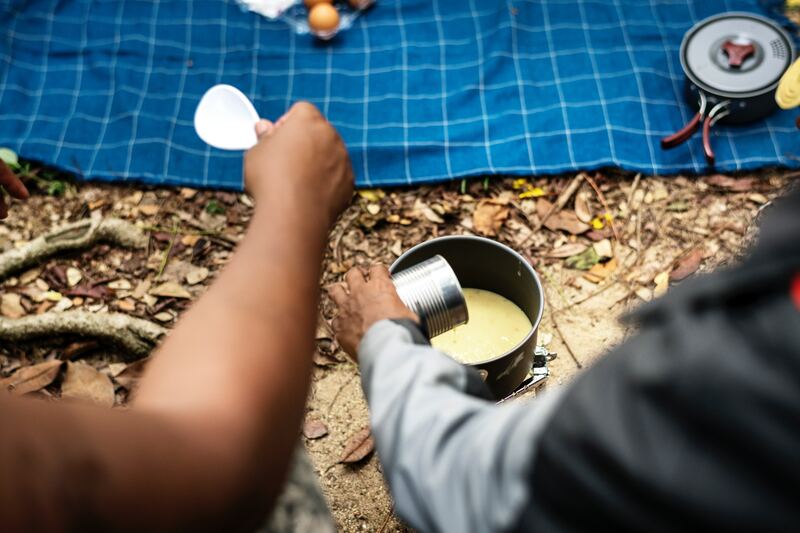 Many simply require water and a few minutes sitting over the fire (in a pan or the bottom of a pot). Scooping up the chili with crumbly cornbread is the perfect way to end the night. This was a quirky idea my friend came up with one night when we were all suffering from the monotony of camp food. We had extra popcorn from the night before, so that was incorporated into the “breading” mix. Instructions: Rinse and chop the zucchini into thin slices. Crack and beat the eggs in a cup. Using a spoon, coat the zucchini slices with a moderately thick layer of egg. Pop the popcorn on the stovetop (pour a thin layer of oil on bottom of pan, place on low heat and shake pan as kernels pop). Once the popcorn is ready, crush the popcorn and crackers and sprinkle them evenly over the zucchini. Fry the zucchini slices on medium heat. Flip them over once one side is browned. Best if served on the side of a sandwich. 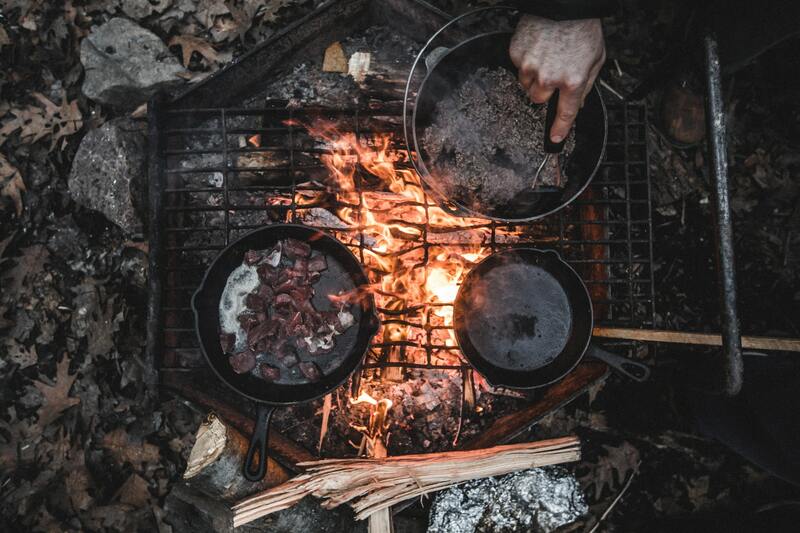 For all the cooking supplies you’ll need to whip up these great backcountry recipes, check out College Outside’s Camp Kitchen for stoves, plates, mugs, silverware, pots, pans, or all of the above. My friend and I created this recipe this summer, when attempting to compose a tasty warm meal for the group. Although it took a while to master the potato:milk ratio, it was palatable in the end. It’s also a great way to please the potato-lovers. Instructions: Chop the potatoes into large cubes and boil them. Skin carrots, chop thin zucchini slices, and sautée both in oil over the stovetop. When potatoes are soft, mash them (I just used a ladle/my minimal arm muscle to do this). Add 1 cup of milk and ¼ cup parmesan cheese. Once the veggies are done sautéeing, pour them in, toss in the cans of chickpeas, and mix. This one is a slightly altered favorite and an easy camp recipe. It’s the ideal meal for a lazy night when your feet are sore, your sleeping bag is winking enticingly at you, and the bottom line is you don’t feel like being fancy (well, garlic bread is a little fancy). Instructions: Boil water, add pasta. Chop the kale, dice the onion, and sautée both together in a pan. Soak the peas in water, then boil on low heat until soft. Pour the cooked veggies into the pasta and mix. Follow instructions on the packet for the pesto sauce (packet + a little olive oil). Mix all ingredients thoroughly. For garlic bread, mix olive oil, minced garlic, and parsley in a bowl. Dip face of bread into the mix and then toast over the stove (or fire) until crispy. Note: If you’re backpacking, sautéed veggies are probably not a feasible option. There is still hope! I’ve been told that sun-dried tomatoes and pine nuts (and if you’re feeling really wild, parmesan cheese) make delicious additions. I created this recipe for a cooking competition at camp this summer. The rules of the competition forced me to include an assigned secret ingredient (mine was coconut) in a dish of my own choice. While I was aiming to spice things up (using only the supplies we keep at camp), this recipe can be altered, dressed up, or dumbed down as much as needed for any kind of trip. But I’m maintaining the integrity of my original coconut “tacos” recipe for fun. Instructions: Hollow out the buns (or just do yourself a favor and buy taco shells), roast the bread over the fire. Chop and sautée garlic, cabbage, and onions. Dice tomatoes, then douse with lemon juice, and sprinkle with salt. Cook 2 cans beans over fire (don’t drain!) and add taco seasoning or red pepper and cumin (heavy on the spices). Layer the sautéed cabbage/onions, beans, and tomatoes on the toasted bread, and add a little tomato sauce. I mixed the tomato sauce with hot sauce for a little salsa-like kick. Then sprinkle coconut shavings on top! This recipe was recommended to me by a friend and avid backpacker. She listed this as one of her favorites. Instructions: At night, place all spices in a small container. Add 3/4 water and mix. Let them sit overnight, make your oatmeal in the morning, and you have breakfast ready to go. The only time I made this recipe, I had to use Dulce de leche and the stuffing from the inside of bread rolls rather than caramel sauce and graham crackers. So arguably I have never made this recipe. Nonetheless, this was what I was aiming to evoke. Instructions: Easy and soooo delicious. Wrap a couple of apples in aluminum foil and toss them into the fire. Eating them plain is delicious but for maximum taste bud arousal, add graham crackers and caramel sauce. Note: You can also do this recipe on a stovetop if you keep the apples on very low heat and keep mixing them/throw them into some caramel sauce to marinate. 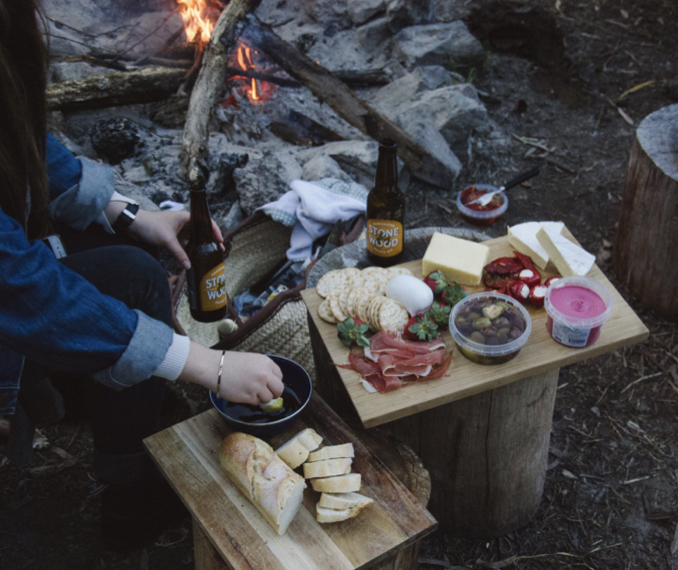 At the end of the day, sitting around the campfire is my favorite way to eat. When you’re out under the stars, it’s hard not to enjoy yourself – even when dinner is a flop. A few weeks ago, a friend and I were making dinner for the group (all camping), and we chose rice with a red bean-and-veggie sauce. To summarize a drawn-out catastrophe, my friend broke the plastic ladle attempting to churn a pot of rice that reached the consistency of congealed glue. But I laughed so hard while “cooking” that my abs hurt afterwards. Plus, getting creative on trail will put a smile on everyone’s exhausted faces. So pull out your sporks and get cooking.